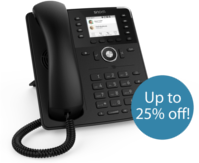 From now until the end of November, you can enjoy 10% off the new Snom D735 in black. As the world’s first sensor-supported IP phone, it features cutting-edge technology – we’re certain it’s going to become a significant contender in the IP phone market. But, did you know you could save even more when you sign up to become a Snom partner? Simply register with Snom’s partner program to receive rebates on your Snom orders, plus benefit from a whole host of additional benefits. As a Snom partner, you could claim an additional rebate on all Snom phones purchased through ProVu. This means you could increase your potential saving on the D735 to a huge 25%!